I am a car guy, but more than that I love just about anythhing mechanical. I want to know how things work and generally how to make them faster! I spent 1/2 of Friday and all of Sunday with Robert Kibbe at the Des Moines Good Guys Show. What a venue!!! The fairgrounds are huge and an awesome place for a Car Show / Cruise / Autocross. I had a blast and it only required walking a little over 12 miles per day to see everything. My favorite car was a Blue Dodge build for the standing mile – 195.5 mph! A Scout running the autocross was an unusual sight. —- But cool as HELL!!!!! Aaron and Robert – This was Aaron’s first ride in the Chevelle since its completion. Maybe best of all was the opportunity to drive Robert’s Chevelle. I wasn’t as smooth as Robert, but I had a great time. Check out one of Robert’s runs here. I have added another way for you to get too much of me – Project Car TV is up and running on YouTube with videos coming out every other Saturday. Get details on how I create some very cool cars and other stuff. Check out PCTV and Subscribe for updates. Driver’s Side quarter panel is Not in good shape. Jeremy’s Chevelle is back from the media blaster and is unfortunately not in as good of condition as we had hoped. After a careful inspection, we will be replacing and/or modifying much of the exterior sheet metal. Smooth Firewall, Brake ducts, and deleted or smoothed door handles are just a few of the items to get some attention, stay tuned for more. Updates are also available on Facebook, and my YouTube channel – Project Car TV. Like and Subscribe to get the latest information as it is published. This is Spring of 2015 just after loading the Rustang on the Frame Jig for major surgery. I am also currently working on a 1968 Mustang Coupe that should have probably been considered “To Far Gone.” The Mustang (Rustang) is going to be a street car with a pro-touring flair and track worthy under-pinnings. I started with a rusted out shell of a car and have been slowly bringing the car back from the dead, with custom full length frame rails, flat floor pans, IRS and a roll cage. I will add the car to the Projects Page and you can already find videos on my YouTube channel – Project Car TV (PCTV) showing how some portions of the project were done. Updates are also posted on Facebook, so check out Allison Customs there and “Like” us. Starting in July 2015 we are beginning a 1966 Chevelle Project for Jeremy McLellan of Cambridge, ON, Canada. That’s right when this piece of American Muscle is finished it is headed off to the Great White North. Jeremy’s goal for this car is a daily driver with performance enough for the autocross. Starting with a 1966 Chevelle that Jeremy bought (sight unseen) in North Carolina and shipped to Allison Customs in Bloomfield, NM. I will be working through dozens of modifications that he has envisioned for his ride. On the exterior we have shaved drip rails, shaved door handles, blacked out or deleted chrome, custom rear spoiler and GIANT 20 x 12 rear wheels with matching 19 x 9.5 inch wheels out front and of course, all riding on a custom frame and suspension package. Moving inside we get custom bucket seating, a dash with the newest technology in stereo and instrumentation, all followed up by a center console running all the way through the car. What is going to motivate this rolling beast of 50 year old steel? How about a 650 Hp 418 cu.in. LS monster motor attached to a Tremec T56 transmission! This is a long term project for Allison Customs and Jeremy, so stay tuned for al l the details and a pictures of the progress. Also, check us out and Like us on Facebook for up to date details on this and all of other builds. Get stock engine running and if possible drivable. The car had been sitting for approximately 10 years when I picked it up. So, after getting the car home I got the power washer out and started cleaning things up. There was decades of grease and oil from a leaky engine and the car looked like the previous owner hauled hay for a farm in it. I found that the engine wiring harness had dozens of wires that the insulation was crumbling away from (common problem for Volvo). So my next step was to start sorting out all of the wiring. Once the wiring was repaired ( I made a new harness to replace the factory one), I was able to figure out that the fuel pumps were not working. As it turned out, the in tank pump was bad and need to be replaced ($30.00). The Main (high pressure) pump was just gummed up from years of sitting with fuel in it. I was able to clean it up and get it running again. Drain and cleaned fuel tank. After all that – the engine would crank and if I sprayed some starter fluid in the intake, it would run for a few seconds. Checked the fuel pressure – Still Nothing. This required removing the intake manifold to get to the fuel distribution block. So, I pulled the injectors and soaked them in Sea Foam while I attempted to clean and rebuild the distribution block. A new intake manifold gasket ($12.00) and about 12 hours of soaking parts. The engine will start and if you keep it floored, it kind of runs. Smokes like hell though. After driving it around the driveway and having to restart it a half dozen times I decided I wanted a better injection system. I have been throwing around the idea of changing out the injection system for a electronic fuel injection system, 5.3L GM engine swap, turbos or a Volvo 5 cylinder engine swap. I finally decided to go with a Volvo 6 cylinder engine with twin turbos. The engine I picked is known as a White Block inline T6 (B6284T) which is a 2.8 liter twin turbo from a 1999 Volvo S80. Not sure what you would use this for, but it sure looks cool enough that I might need one! Welders, plasma cutters and sheet metal breaks are very nice to have on hand if you have the budget and space. However, the most important items to have in your tool box are a good set of sockets, wrenches, screw drivers, a jack and some jack stands. So, what makes for a “good” set of tools? The answer to that will usually differ from person to person. For instance, my two grandfathers each had a very different idea of how best to choose a tool; and both have their merits. Trays like these, make moving your tools around the shop very easy. My maternal grandfather (Amil) grew up on a farm in Oklahoma and went on to work a wide variety of jobs before settling into a career with the Laboratory in Los Alamos, NM, where he worked for decades. His philosophy was, “Buy the best tools available, even if you can only buy them one at a time, out of each paycheck.” My paternal grandfather (Shirley) grew up on a farm in the South during the depression. He was forced to support himself from the age of 14 or 15 because his family couldn’t afford to care for him. He worked all kinds of jobs, both military and civilian, and he eventually became a welder. He helped to design equipment that was used to clean, straighten, and repair the rocket sled rails at White Sands Missile Range during the space race era, and he always told me, “Buy the best tool you can afford, and don’t borrow what you can’t afford to replace – if you damage or break it, you own it.” Here I’ve given you examples of two different schools of thought from two men who used their tools on a daily basis. One told me to buy the best – PERIOD. He believed that, by buying the highest quality tool, you would never have to replace that tool if it was cared for properly and used appropriately (a screw driver should never be used as a chisel or pry bar, and an adjustable wrench is NOT a hammer, even in a pinch). The other said buy the best you can AFFORD. He believed in buying what was immediately available to him for a price he could pay. He was also careful with his tools and, while they may not have lasted forever, they held up well and didn’t need replacing for a long time. When the time came to replace one he, again, bought what was available and affordable. As time went on, he could afford better quality tools, and eventually he, too, owned the very best. Very nice rack of wrenches – mine are NOT stored this neatly. The question of whether you need a new set of SnapOn or Matco wrenches, or if a set of big box store wrenches will work for you can only be answered by . . . you! Ask yourself – how serious is this hobby of yours? Will you ever be attempting to make a living at this? Personally, I buy a lot of Craftsman tools. They are readily available, have a good warranty and rarely break (if I use them properly). For some of the more specialized tools, I look for higher quality if I expect to use it often. Other times I might buy a very inexpensive tool, because I may only do the job it is designed for once, and I figure even the cheapest tool should work once. to have someone else do it for you. On the other hand, if your mission is to learn a new skill, and you enjoy the process of doing it yourself, you can often buy the tools for the cost of someone else’s labor. This is the reasoning I used a few years ago when I installed a lift kit on my truck. I wanted the experience of doing the installation myself; I am a serious hobbyist and I enjoy teaching myself new things. I bought the tools I needed to remove the torsion bars and hubs, and spent a fun weekend doing the install. When it was done, I had gained some new knowledge, the job was done to my standards and satisfaction, I found myself $100.00 ahead on the project and I owned the tools, which I have used at least twice since. I’d call that a win! In Part 1, which was all about planning for your project, it was mentioned that you should locate and purchase your project vehicle. For this article, we will assume that you have done so and are in possession of the vehicle. If you are like me, from the moment you got the vehicle home, you have been itching to dive into the tear down and to get started beating out the dents. First, you need to have a method in place for bagging and tagging all the reusable parts. For storing small parts, ordinary sandwich bags with the zip-lock work really well. You’ll need to have 100 or more on hand, as well as another 20 to 30 gallon size bags. For the engine and transmission parts, you can go to a machine shop and, for just a few dollars, pick up a few very large, heavy duty bags. Once you have your parts bagged up with the associated hardware, make sure to label the bag with a good permanent marker. Write down what is in the bag and where it came from, ie, “Passenger Door Panel”, or “Wiper Motor”. For those parts that are just too awkward to bag, my solution is to use green masking tape (sticks to just about anything) and write down where the part came from. It may seem silly to tag a large part like a door sill, but even a small notation indicating L or R can make a long day easier. Now you may be wondering what to do with all those baggies! 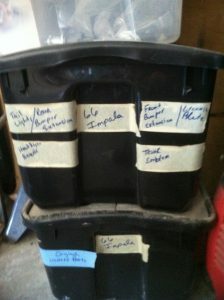 I use plastic tubs from one of the big box stores – they are fairly inexpensive and readily available in various sizes. A typical tear down may require 10 to 15 tubs for all of the parts. 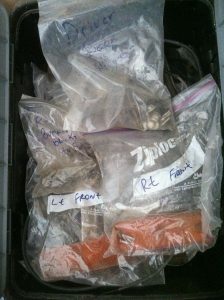 I also try to group parts together in the tubs, which prevents me searching through every tub for similar parts. Here again is a great place to make use of your green masking tape. Just tear off a few strips and put them on the outside of the tub, and write down your project name, and list what the tub contains. Even if you only have one project in your shop, the project name keeps you from opening box after box of Christmas ornaments and old clothes before you find what you are looking for. I use shelving that I built in the corner of my shop to store items. If they are too big for my shelves – for example, seats or the engine – then they go to another storage building on my property. I know it’s a bit of a buzzkill for me to talk about storing and organizing and labeling when all you want to do is get your hands dirty, but I can’t tell you how many good, usable parts I’ve had to replace because I couldn’t find them again when I needed them. This small thing is a big money saver and eliminates a lot of frustration! You are almost ready to pick up those tools, but – if you haven’t already done so – you need to take a lot of pictures of the vehicle. No matter what you have; car, truck or tractor, get pictures of the interior, exterior, engine, underside, etc. When you do start taking things apart, take more pictures of the individual parts and the hard to see stuff. It makes it much easier to put it all back together if you have a visual to refer back to. Now, last but not least, you need to get a pen and paper and, as you pull parts off, make a notation of their condition. Are you reusing, replacing or refinishing? Parts that are being reused in their current condition get bagged and tagged and put away. Parts that need to be replaced should go on your “Parts Needed” list, and should be stored separate from your reusable parts. TIP: Don’t get rid of the original until you know the replacement is going to fit. Parts that need to be refinished or repaired, but are reusable should go on another list and, again, be stored separately. Finally, make a list of parts that are just plain missing! Luckily, missing parts are easy to bag up and take up very little space. Of course, they also tend to be the most expensive and the hardest to find replacements for! Using this system, or whatever method you prefer, will help keep your project organized and on track. Now, get out there and power wash everything, take pictures, break out the tools and have fun! PS – I have set up a forum @AllisonCustomsOnline.com. Take a look and load up a few pictures of your shop or your project. Thanks for reading! Daily Driver / Factory Correct Restoration? throw in some humor or, maybe a little drama, and you might read it once, and think, “well, that was a neat story,” and that would be the end of it. Nothing wrong with that. The best place to begin with any project is to make a plan. Before the first turn of the wrench or the first spark from the grinder, you should establish a solid plan by asking yourself some crucial questions. Start by figuring out the answers to the following questions. What do you want from your vehicle? Do you want a street car that you can race or a race car that goes out on the street? Do you want a factory correct restoration, a rock crawler, etc? The time to decide is before you start! weld or do body work. Take the time to find the right car, truck, motorcycle or wagon that truly fits your plan. SOMETHING TO THINK ABOUT: Chevy, VW and Ford probably have the most parts available from the aftermarket. A Helica or Tucker are going to take a lot of looking. If you choose an obscure project vehicle, you are going to spend great amounts of time looking for obscure parts, not to mention the money it will take to purchase or refurbish those obscure parts. If you have the time and the money – go for it! If not, you should probably rethink. If you’ve already got the vehicle, have you assessed its condition to determine the level of restoration needed? What is your budget? How much can you spend – TOTAL? WRITE IT DOWN! This isn’t Congress, so don’t plan to spend what you don’t have! How much time do you have to invest; weekly, monthly, yearly? Estimate the time you think your build will take … then TRIPLE it! Do you have the space to garage your project, or are you renting, or even borrowing? If you are renting space, be sure to subtract the cost from your total budget amount. If you are borrowing space, be sure to discuss with the owner how long you will need the space. Be Honest! There is nothing worse than being half done and in bare metal when you get kicked out into the rain! I like “Bench Building”; which, much like “Bench Racing”, is a time honored method to waste hours of time and has nothing to do with building benches or anything else useful. For those of you that have not been initiated, Bench Racing and Building are all about laying down the tools, picking up your favorite adult beverage and day dreaming, preferably in your shop with a few friends, the smell of gasoline, burnt clutch, and Orange scented hand-cleaner filling your nostrils. By the way why do all hand-cleaners smell like oranges? But I digress. I like to dream up some rather unlikely car and drive train combinations and see how far I can get in the design process before I decide I must just be completely crazy. Now many of you know I work for an airline and I drive 172 miles one way to work each week to Albuquerque or if I have an odd trip for the week I drive all the way to Phoenix, AZ (about 425 miles each way). That works out to about 3 hrs for the short trip and 6.5 hours for the long one, spent in my hoopie car. (I don’t know where the name came from, but every small car my family ever owned got that name – on lives the tradition!) All that time spent on the highway lead me to decide that I need a good, comfortable, smooth running, smoothing driving car with reasonable fuel mileage. Can you hear my cranial wheels turning? – Bench Building time! Currently, I drive a 2006 Nissan Sentra. (BECAUSE IT IS GOOD ON GAS! SO LEAVE ME ALONE ALREADY!) It is getting a little worn out, and I am getting tired of driving a roller skate. I would like a little more space and a smooth ride that can also hold its own on an on-ramp. With that criteria in mind, I bought a 1981 Volvo 242. The purchase of this particular car was partly influenced by nostalgia. I had a 244 in high school and part of college, and have always missed it. (Difference is 2 vs. 4 doors) It was a GREAT highway car. My “new” Volvo will need a few things; a new Ford Coyote V8, 6 speed trans., and a full up air bag suspension for the smooth ride and the ability to carve corners. A little paint and interior, sound system, Nav, and – well you get the idea. In the meantime, a good friend of my suggested I buy his Town car and just drive it. He maintains it meticulously and hey it only has 150,000 miles on it so it should be good to go. Of course, we all know nothing stock is EVER “Good to Go”. As my mind wonders about the possibilities with the Town car I remember that I have a set of turbos I bought (cause I couldn’t live without them), and they would fit real nice under the hood of my new cruiser. You know 8 psi, twins, intercooler should be up and running in like a week – Right? Wait. I already have the Volvo – Town car is out. So, I start thinking – (yes, there was smoke) what if I pick up a C4 Corvette (No, not to drive)? Would the 242 body fit? As it turns out, they almost fit, which is close enough to send me off on another tangent. I could flair the fenders like Volvo did in the 80’s for their racing teams and shorten the C4 frame and WALA. Presto! Magico! – I have a real corner carver! But wait! You know what would be even better?! I know where I could get an early (small body) International Scout! I bet that would fit the C4 almost exactly. How cool would that be? A Scout that can go fast and turn? I am not driving an old Scout (Corvette underneath or not) to and from PHX or ABQ every week! Thanks Dad – Way to ruin a perfectly good Bench Building session. Reality – who needs it? Where is all this going you ask? I don’t know. I am just daydreaming and spewing my thoughts out on to this keyboard. The upshot of all this is – if you try enough scenarios you will eventually come up with at least one you really like. Then, you should get out there and build it. You only live once. To have a great life, you should work hard, be the friend that you would want to have, love like it all ends tomorrow and, most of all Enjoy it! Build it! So let’s hear your ideas. What Benches are you Building?